Fresh off Georgia State’s 27-17 AutoNation Cure Bowl victory, 17 young players signed their National Letters of Content to become Panthers. The first early signing period in college football history comes on the heel of Georgia State’s first bowl victory in program history. Nine defensive and eight offensive players signed to head coach Shawn Elliott’s program. Many coaches across the country, especially those of Power 5 conferences have expressed their unhappiness with the new early signing period. Elliott and his staff were not bothered by the change. “It really didn’t change the calendar, because right now you’ve got to recruit year-round. You’ve got to really push the envelope and recruit every single day, 24 hours a day, 365 days a year,” Elliott said. However, the Panthers enjoyed just three days in between their bowl game and the early signing period. “What it did do was make us push up our visits as we were preparing for a bowl game. That made it made it a little bit hectic, but it turned out to be great. We had great visits. All in all, I’m a big fan of this early signing period,” Elliott said. The historic season’s impact may not be felt until the class of 2019 signs in next December. The class of 2018 is the first class Elliott was able to recruit for year-round. Elliott, who took the job just over a year ago signed 20 student-athletes in January of 2017. In the classroom during Elliott’s first semester in Atlanta, his team earned a 3.03 GPA (grade-point average), the highest in program history. Academic strength is a trait Elliott desires in recruits, but there are endless pieces to the puzzle of what makes a Panther these days. Perhaps the most anticipated signee is junior college quarterback, Dan Ellington from Itawamba (Miss.) Community College. According to 247 Sports, three-star Ellington is the seventh-ranked dual threat quarterback from the junior college ranks. The Panthers welcome in three offense and four defensive lineman. 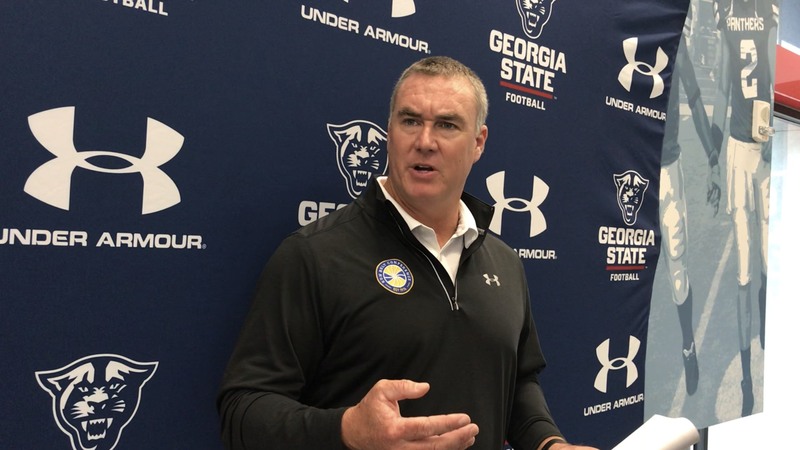 When Georgia State lost games in 2017, they struggled keeping quarterback Conner Manning upright, running the ball and applying pressure on the opposing quarterback. Elliott wants to make sure his players are healthy after the long season which stretched into mid-December. He will decide when spring practice begins shortly after classes resume on January 8. The Panthers held their first practice on March 20 during last spring. Herman McCray (TE, 6’4, 230, West Palm Beach, Florida, Oxbridge Academy).